I mentioned at the beginning of the week that I'm mailing vintage, Christmas-themed postcards across the globe as my half of the bargain for Postcrossing. The other half of the equation, of course, is receiving holiday-themed cards from all over. And a dandy one popped into my mailbox this week. "On this postcard there is a cat. It is the wonderful cat from Russian fairy tales. His name is The Cat-Bayun. ... In our culture there is tradition, that cats help in looking after infants and swing cots when children are sleeping." According to Encyclopedia of Russian and Slavic Myth and Legend, Kot Bayun was "a talking cat that lived in the Thrice-Ninth Kingdom with the Thrice-Ninth Land." A popular character of many Russian tales, Kot Bayun has a dual personality. In Russian "bayukat" means puts to sleep. Or "bayat" — tell the stories. On the one hand, this giant cannibal cat lulls to sleep the knights with with its magic voice and then kills them. The bravest ones, that manage to catch the cat, obtain the chance to cure the illnesses as the cat's tales have the healing power. 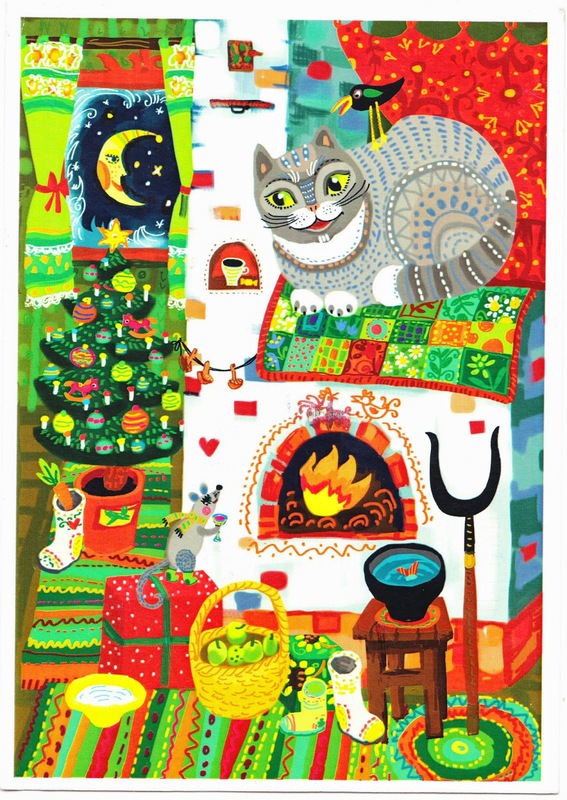 Kot Bayun is a frequent character of many Russian tales and is most likely the prototype of the learned cat in the introduction to Pushkin poem "Ruslan and Liudmila". So it seems as if Cat-Bayun/Kot Bayun has a bit of a dual personality, which is not uncommon for some of the oldest characters of folklore. Baba Yaga is another Slavic figure that has a history of being on both the dark side and the light side. One thing is for sure, though: This is a festive postcard. And that cat looks like one you want in your house. I'm not as sure about the bird, though.